When I saw the sketch, I saw an acetate panel so I decided to run with that. 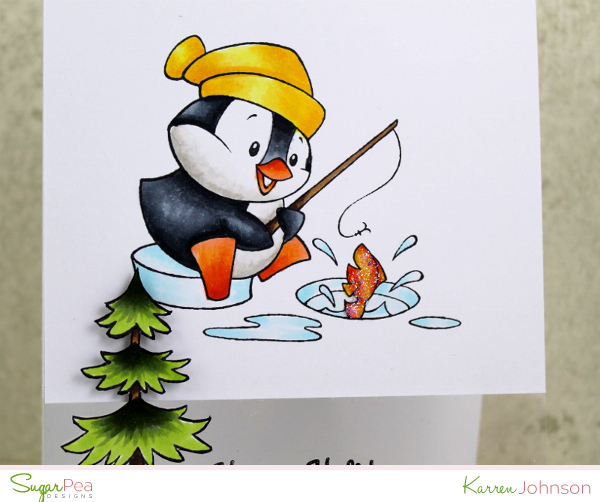 I stamped the cute penguin onto X-Press It cardstock and colored him in with Copics. I added some Stickles to the little fish. I stamped, colored and fussy cut the tree and adhered that onto the acetate and white panel. 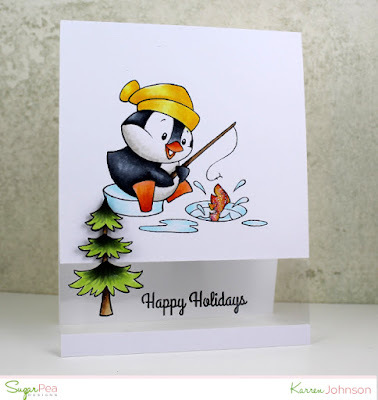 The sentiment was stamped in Black Stazon ink. Upload to your blog or other Online Gallery using Keyword: SPDMIU13 so that we may check out your beautiful work. Your card is so cute!!!! And I LOVE the acetate panel! 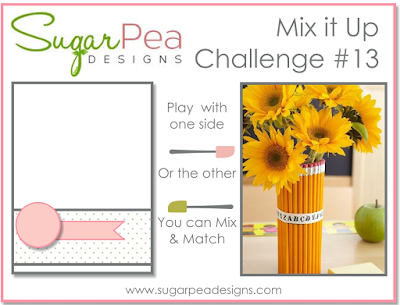 I sure have enjoyed designing with you this term at SugarPea Designs! You are SO talented! Hugs! Thankyou so much for sharing your amazing talent. Wish I could do my cards as good as this. Oh my goodness, your little penguin is absolutely adorable! I love how you split the CS for the tree, and your coloring is amazing, Karren! You did such a great job combining the sketch and color palette!